Yes, I am the Allison DuBois that the TV show ‘Medium’ was based upon. My story started well before the show. I launched this website back in 2003 with my husband, Joe, as the webmaster. My original welcome remark says it all. 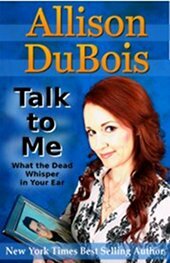 “Hi my name is Allison DuBois, welcome to my website. I belong to a new generation of mediums who are out to break old stereotypes that put a negative spin on people with mediumship abilities. I call things like I see them and I am not afraid to push the boundaries of my abilities. I pride myself on accuracy and bringing closure to people who have lost loved ones. Through the years I have kept the same goals. I have added a newsletter and video blogs and a shopping cart, but in the end it is still about helping people. The TV show was a great success too! With 130 episodes and 7 seasons. It is showing on every continent around the world. It was quite an experience to see my life played out on TV. Now it is a new experience to watch the re-runs, all of these years later. Please take some time, watch the videos and read the FAQs. I am constantly adding content to help achieve the goal of helping people.